Mina, our chef, loves to teach others how to cook Thai Food in her own traditional Thai house on Ko Yao Noi, a beautiful island in Phang Nga Bay, near the island of Phuket, Thailand. 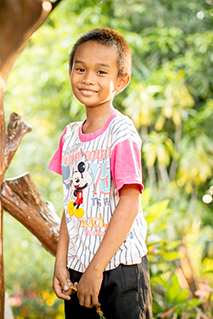 Her house is situated in a quiet neighbourhood just outside the market and has an amazing view over the rice fields and the ocean. Mina grows a lot of Thai herbs and spices herself in her garden, which you are going to use for cooking your delicious Thai dishes. With her excellent English skills, she is going to teach you how to use real Thai utensils. The kitchen suits four people. By the way, do you know where coconut milk comes from? 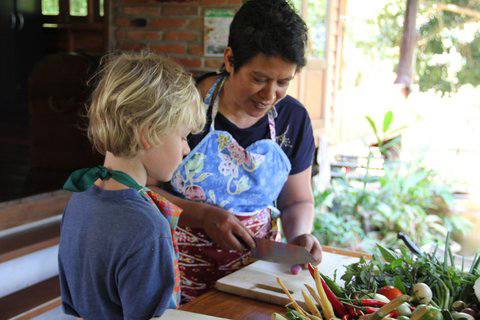 Mina will show you how to produce it in the traditional Thai style. She will also teach you how to make curry paste yourself. And at the end of the course, you will get a cook book so you can make the dishes yourself back home. 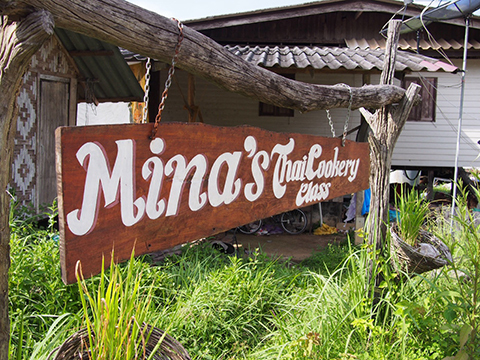 Enjoy your self-made Thai food during sunset in a delightful and beautiful setting at Mina’s house. Now you just need to choose your course, and off you go!